Growing plum trees in the home garden can be fun and rewarding. Several factors are important to consider before planting. Soil Type Preferred - Plum trees grow and produce the best fruit in well-drained but moist fertile soil that is rich in organic matter, but tolerate a wide range of soils as long as water and nutrients are not limiting and soil pH is adequate. Peach tree roots will not tolerate soils where water remains on or near the surface for more than one hour after a heavy rain. They are tolerant of heavy clay soils if drainage is good. In soil with low fertility or compact clay it'll be worth your time to mix in some organic compost to the native soil. They like the soil to hold a good supply of water, especially when the fruits are developing in summer, but not so much water that the soil stays constantly soggy or wet. Below are general guidelines for properly planting a container-grown plum tree in most untilled, average garden soils. STEP 1 - Begin by digging a hole at least twice as wide and a little deeper than the rootball is tall. Place the native soil removed from the planting hole around the perimeter of the hole. STEP 2 - Depending on the fertility and porosity of the soil you are planting in, you might need to add a soil amendment to the native soil removed from the planting hole. When planting in heavy clay soil, it's a good idea to thoroughly mix in some good organic matter such as composted cow manure, mushroom compost, and/or sand at a 25 to 50% ratio with the clay soil. When planting in very sandy, quick-draining soil you might want to consider adding in some peat moss and or compost to help retain moisture. When planting in fertile, well-draining soil there's no need to add any soil amendment. 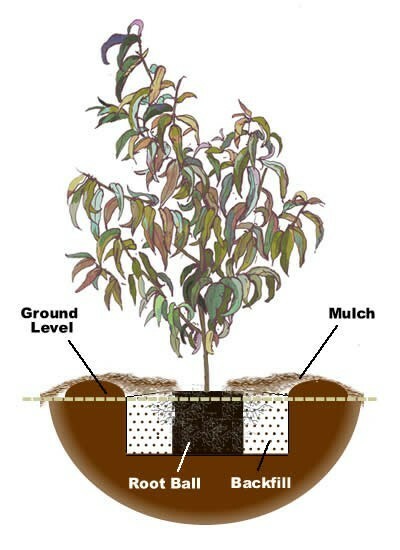 STEP 3 - Remove tree from container and carefully loosen feeder roots around the surface of the rootball. If necessary, use a claw tool of some sort of tool to loosen roots. STEP 4 - Place tree in hole making sure that the top edge of the root ball is 1-2" above ground level. This will ensure that the fruiting stock will begin to produce its own roots. If necessary, place additional soil in the bottom of the planting hole to achieve proper planting height. Then start pulling your backfill soil mixture into the hole around the rootball, tamping as you go to remove air pockets. When you have filled the hole to the halfway point you can soak the soil. Then continue back-filling to the top edge of the root ball, tapering your soil mixture gradually to the ground level, essentially creating a slightly raised mound. Do not put any backfill soil on top of the root ball as doing so can suffocate your plant. NOTE: All plum trees are grafted. This means that a branch was removed from a specific variety of tree and then "attached" (grafted) to a seedling of another type of tree. Take care when you plant a new plum tree not to bury the graft, where the fruiting stock joins the rootstock. This is usually a bulging area near the base of the trunk of the tree. STEP 5 - With remaining soil mixture, or additional native top soil, you can build a water retaining ring around the perimeter of the planting hole to a height of around 3 to 6 inches or so, depending on the size of the tree and it's relative water needs. STEP 6 - Broadcast a good granular fruit tree fertilizer, or organic fertilizer, atop rootball at rates suggested on product label. STEP 7 - After planting, fill water retension area with water and allow to soak in. Repeat this process one or two more times. If planting in winter, dormant trees will require litlle if any water with average rainfall until they break from dormancy in spring. Trees planted during the active growth season will require closer attention to watering, but be careful not to overwater. Water enough to keep the soil moist, but not constantly soggy or wet. STEP 8 - To retain adequate moisture, apply a 2-inch layer of shredded wood mulch, or a 3-inch layer of pinestraw to a distance of 2-3 feet from trunk of tree, or just beyond water retaining ring.